Although I’m not exactly a dullard when it comes to identifying our native British trees, there are rather a lot of them. So when the Wiltshire Wildlife Trust’s Paul Darby sent me an invite to join him once again for a morning Identifying Trees in Winter he didn’t have to ask twice. I can tell an Ash from an Oak, identify Hazel, Alder, Beech, Horse Chestnut, Field Maple, Sycamore, Walnut, Hornbeam, Yew etc and can separate Hawthorn from Blackthorn even with no leaves. I can even identify some less obvious ones like Spindle but, where I struggle is with the tricky little blighters like the Willows which so often hybridise. Our venue for the day, Ravensroost Wood, proved to be a great choice as it contained many of our original native species like Wych Elm, Guelder Rose, Aspen, Small-leaved Lime and the rare almost Rowan-like Wild Service-tree. 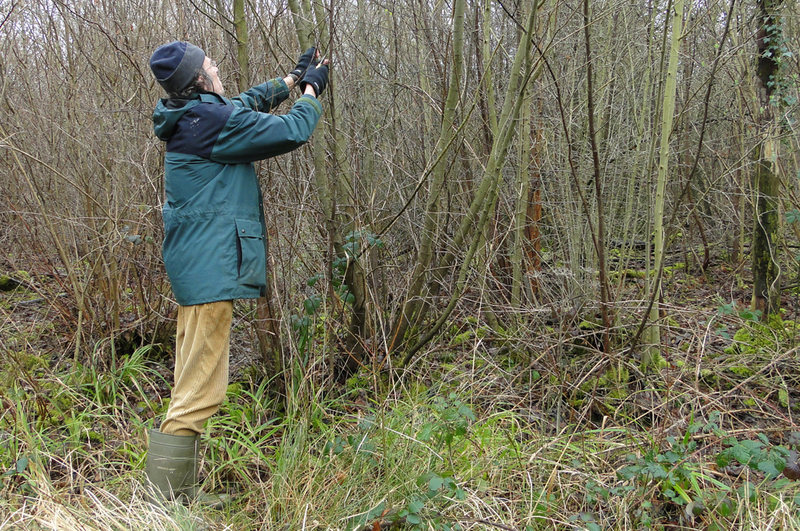 Spending time with Paul is always a pleasure and of course being an expert botanist he is full of useful tips for making tree identification easier. Are the buds opposite or alternate? Is the bark smooth or deeply fissured. For example, Silver Birch and Downy Birch which can look almost identical are easily separated by simply looking for small hairs at the tips of the buds on the new growth. So now I can check whether that Silver Birch I bought from the garden centre is actually what it said it was. Before today I didn’t know Crab Apple’s had spines, or that the Hazel has both male and female catkins. 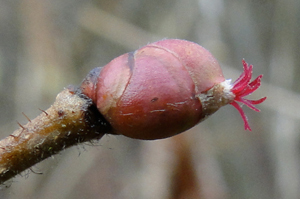 We’re all familiar with the droopy yellow male catkins of course but somehow I’d never noticed the tiny magenta female catkins that once pollinated go on to form the hazlenuts (see photo below). It’s all there in the reference books of course but somehow it’s not the same as having it all quietly explained to you in the rain. Ravensroost Wood is an ancient wet woodland dating back to at least 1600 and is a Site of Special Scientific Interest (SSSI). Being very old the wood is full of delights like Wood Spurge, Goldilocks Buttercup and Enchanter’s Nightshade and a few rarities like Bitter-vetch. Plus if you’re into fungi you’ll find Amethyst Deceiver, Yellow Brain, Candlesnuff and the spiky Hedgehog fungus.